Betty is a graduate of Kirkwood Community College's Dental Assisting Program. Betty has been working in the dental field for over 32 years in both Iowa and Illinois. 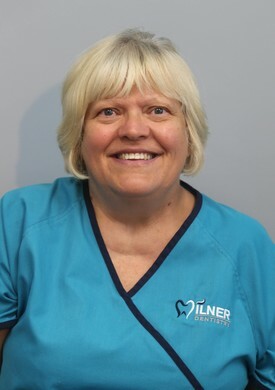 She has been the receptionist at Milner Dentistry since 1995. Betty shares many important responsibilities throughout the office such as dental assisting, answering the phone, scheduling appointments, greeting patients and much more! Betty's work ethic is second to none and she will go out of her way to make sure the patient feels comfortable and right at home. Betty has been married to Larry Wade for 39 years and is the proud mother of 3 adult children whom have produced her 9 beautiful grandchildren. During her free time, Betty enjoys reading, gardening and spending time with friends.